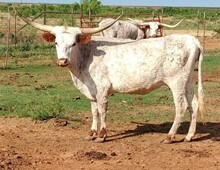 A well built BAR B Q daughter that has an outstanding pedigree for horn. Her half sister sold twice for $60,500 total and her grand-dam sold for $82,000. Grand dam, Sabrina 115 is considered by many to be the best Coach daughter in the business. Talk about a cow-powered lineup. Just weaned a stout Fire Proof heifer and exposed back the same.